FILE - In this undated file publicity image provided by Discovery Channel, a great white shark swims near Guadalupe Island off the coast of Mexico. Conservationists are hailing what they call an historic agreement to give greater protection to sharks threatened by illegal trading practices. The agreement, which takes effect on Sunday, puts several shark and manta ray species under the protection of CITES, the Convention on International Trade in Endangered Species of Wild Flora and Fauna. This theme music from Jaws, the 1975 Hollywood thriller about a killer shark, has terrified generations of moviegoers. CITES Secretary-General John Scanlon thinks the bad rap sharks are getting is unfair. “The reality is the number of shark attacks are extremely low. The risk is extremely low, but it is a very hard profile. … Scientifically, you know, you need sharks. You need the top-end predators. They are a critical part of the eco-system. And, the fact that something poses a risk to human beings is no reason to be rid of it,” he said. 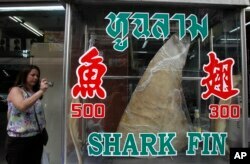 A woman takes a photograph of a dried shark fin on display at a restaurant in Bangkok, Thailand, Mar. 5, 2013. Head of CITES Scientific Services David Morgan says profits from the unregulated trade of these products are huge. Unfortunately, he tells VOA this is leading to overfishing and an 80 percent decline in several species.